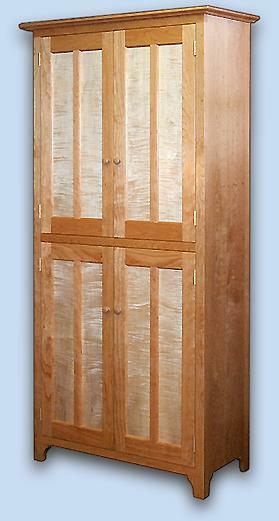 This cherry and tiger maple Shaker cupboard measures 84" high x 36" wide x 15" deep. The case is crafted out of solid cherry. The four doors are made of cherry with flat book matched solid tiger maple panels. This cupboard was designed to store an antique china set. Each piece is custom built out of maple, birch, walnut oak, pine or any wood desired and can built to accommodate any need.